In my old house, I pretty much touched every single surface - sometimes for fun, sometimes out of necessity. Well now we have moved to Texas and our house is brand new...but, of course I cannot leave anything alone! I am lucky enough to have a craft studio in my new home - one "problem"...it had carpet. I am so MESSY. I figured I was either never going to craft for fear of spilling or I was going to make such a mess that my husband might flip his lid. So I decided to flip his lid in another way...I told him I wanted to remove the brand new carpet and stain the concrete floors. I got a lot of looks (not good ones) from hubby...but finally after presenting him with a well thought out argument and plan, he agreed. And, my parents were coming to visit...so I knew I would have a partner (or two) in crime as I began this DIY. I would not say this process was hard...but it was time consuming and could be tedious. 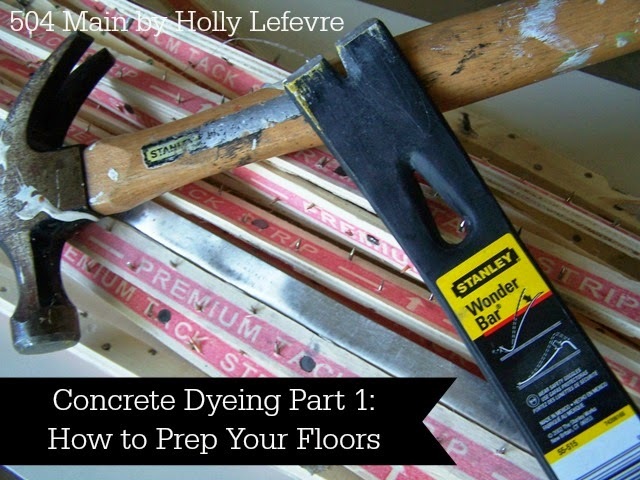 Here is part one of my concrete staining adventure...THE PREP. The preparation of your floors is the longest part of the process and the most important. I did my homework - I read a lot of information and tutorials. The contractors who are working on other parts of my house laughed at me...a lot! My verdict - this project was not "hard," but it was time consuming and possibly labor intensive. I started with a kit, purchased at the Home Depot by Behr which even though I had to purchase extra product was still a good deal (see supply notes). One additional quart of tintable base color (I would have bought a gallon but they were out). Rags or old towels are a good idea too! NOTE: THROUGH OUT THIS PROCESS IT IS IMPORTANT TO PROTECT YOURSELF WITH THE PROPER GEAR, WHICH INCLUDES BUT IS NOT LIMITED TO: GLOVES, EYE PROTECTION, FACE MASK, PROPER FOOTWEAR. Make sure the room has good ventilation too. It was hot when I did this, but I turned off the AC and opened all the windows. Remove the Carpet (and padding). I was fortunate that my carpet was not glued down. 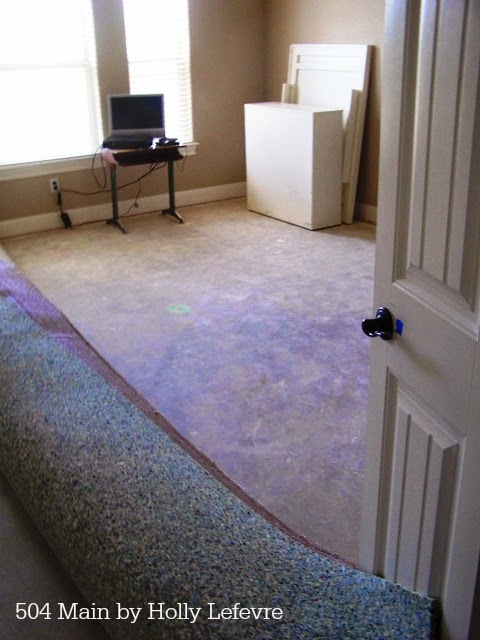 The carpet was also clean and new so there was not a lot of dust or allergens under it. As for my concrete floors, they had cured (kits says 30 days) for over 90, and my concrete was relatively "clean." I began in the far corner and used a screw driver to loosen the corner. It came up easily and then I rolled it. Around the perimeter of the room, I had to give a slightly harder tug because of the carpet tacks. Remove the tack strips. I used my Stanley Wonder Bar (one of my new fave tools) to loosen the nails. My Dad was a carpet layer when I was born...so he advised me with which tool would help the best and how to do it...but I did it all by myself. I followed the perimeter of the room, loosened the nails and pulled the tack strips up. Be careful, those tack strips HURT! Some holes were left in the concrete after removing the nails. Place the groove of the wonder bar under the tack strip, with the nail in the groove. Smack the end of the wonder bar with a hammer. It took me a few tried to feel comfortable with how hard and where I needed to hit. Fill in the holes. Removing the nails left small holes around the perimeter. Depending on the age and condition of your floor you may also have to fill in cracks. I did not have any cracks. I used Wet Concrete Patch to fill in the holes. Smooth them out with a putty knife. (I did not smooth mine out as much as I should have, so I have to work harder on those areas later...after it was dry). Let dry. Remove any additional excess of the cement patch and sand if necessary. Protect your walls and baseboards. 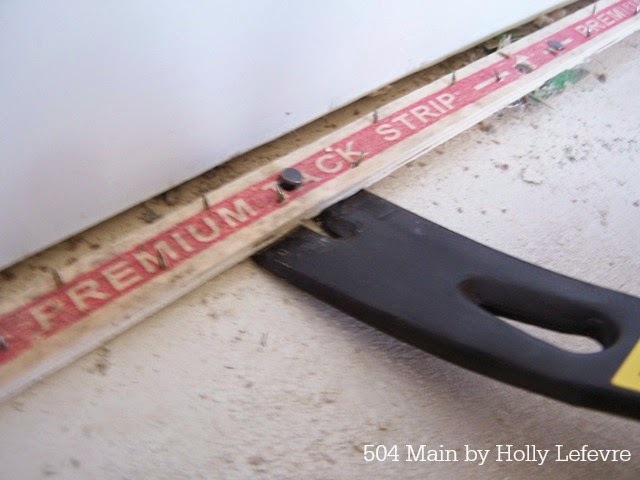 NOTE: You may want to consider removing your baseboards to be really safe. I left mine on. The solution went in/under the gap (where the carpet was) and the bottoms of my baseboards expanded and were plain ugly and deformed. 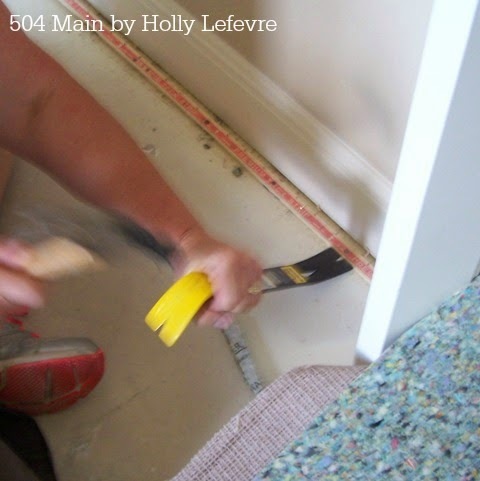 I did not want to replace the baseboard (not part of my plan). I purchased trim (quarter round) to cover the gap, BUT ultimately had to replace 2 of the 4 (large) baseboards. I used Scotch Blue Tape (2") and painters paper for the cleaning part. (Later you will see when I used the dye, I added plastic to cover the walls higher up). Time to clean! Use a plastic watering can (or bucket), rubber gloves, face and eye protection! Do not use metal with the etcher/cleaner (that is what the instructions say - bad reaction between metal and acid???). I used a plastic watering can (as per instructions) and a thick bristled broom. Open the windows, wear your face mask - it has a definite odor. Mix 1 part etcher to 3 parts water in a plastic watering can, and stirred with an old wooden spoon (not to be used again for food service). Begin in the far corner and "water" your floor. Let the solution sit for at least 20 minutes. I chose do do section - for example the back 1/4 of the room first, then the side back quarter. I noticed that the etcher was drying before I could get to it when I did the larger areas. 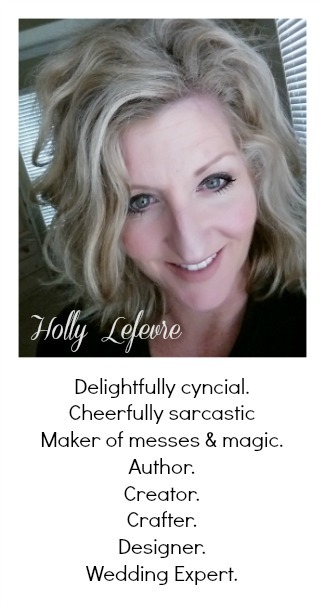 SCRUB like crazy with your broom. There will be a filmy, foamy residue. Repeat as necessary until you clean and etch the entire room. Wash the floor with water and a mop (without any metal parts). I had to empty and refill the water many times. I also used my Wet Dry Vac to get up the excess water. STEP 9 This is where I saw/realized the excess paint all around the perimeter of my room and the construction markings showed up bright than before. 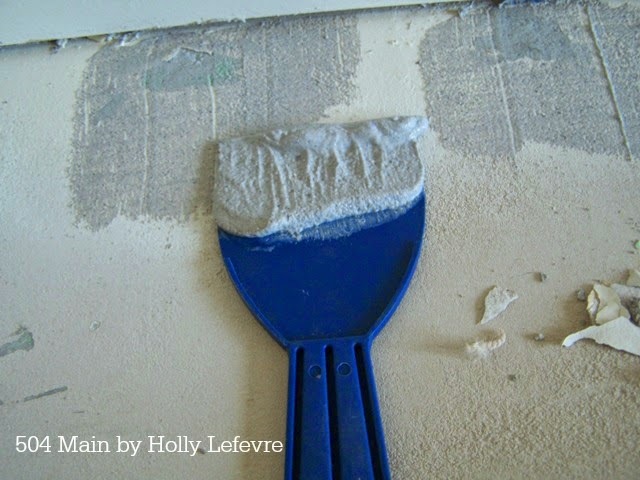 I used a Husky Bent Handle Paint Scraper to go around the room and scrape up paint and other debris that I missed. I used the metal scraper now...BECAUSE I had cleaned the floor with water. I then used water and a stiff brush to work on the construction markings. The paint had already been loosened up with the cleaner. I felt it was necessary to clean again (see my notes in supplies). I repeated steps 6-9. I just figured I would rather clean a second time to be sure than to risk the dye not adhering properly. Let dry completely. I waited 24 hours. The floors is ready is their is no residue on it when you wipe a finger on it, the debris is gone, and it feels gritty. 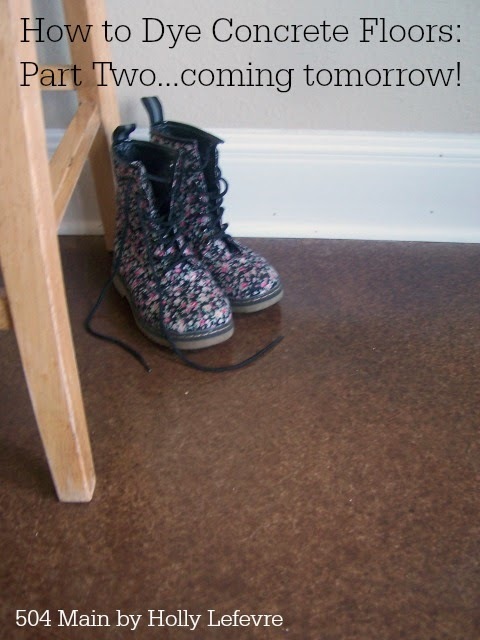 Now I PROMISE...tomorrow...I will show you how I dyed the floors! Thanks for sharing this, Holly. It looks great!! Can you do Garage floors, I live in Vermont, gets cold in the garage. I like the staining look the best, But would paint it too. I cannot find an email for you anywhere...I sure hope you see this. With proper cleaning you can do a garage floor! The instruction suggest applying the stain when the weather is between certain temperatures, but after that you should be good! 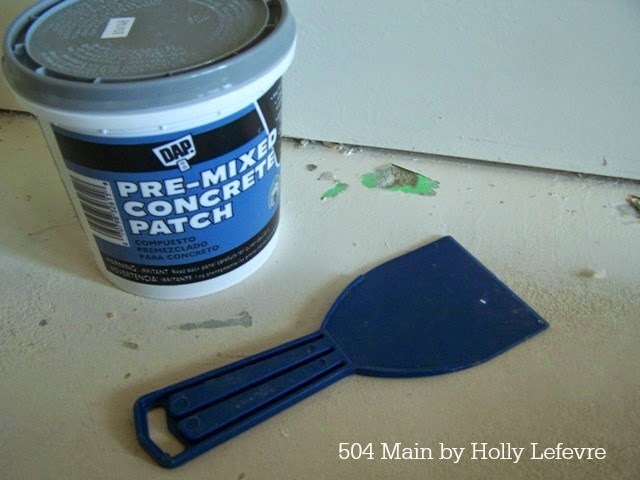 Hi Holly, ive reached the point where i see paint and putty marks from the contractors. The cleaner you used will remove everything? Hi! This cleaner removed all of the contractor junk that was on the plain concrete. If you are looking to remove unwanted marks and mess from a surface you are preparing to cover, this would work. I would not use it on a surface that is already finished.